It’s now become apparent that Win10 1803 Bluetooth (BT) has undergone major upgrades and revisions. This comes thanks to some clever sleuthing work from the folks at MSPowerUser.com. I’d pretty much figured out that something must be up, because of rampant squawking about BT in 1803 at TenForums, answers.microsoft.com, social.microsoft.com, superuser.com and elsewhere. But the MSPowerUser story nicely depicts the differences between 1709 and 1803. It also shows that when Win10 1803 gets new Bluetooth version, mischief and mayhem may follow! Items in bold represent new or updated items in the 1803 BT stack. In the afore-mentioned Windows forums, there’s been plenty of BT-related traffic in the wake of the 1803 release. Most of it recounts lost, missing or non-functional BT devices. This seems to afflict mostly USB-attached BT devices. But it apparently applies to plenty of built-ins as well (most of which use USB under the hood anyway). To some extent, users have been able to solve a subset of problems. By replacing new Microsoft generic drivers (new stack, new drivers) with older drivers from the device manufacturers, they’ve returned to work. Of course, this says sayonara to new features and functions. But most users appear convinced that a working and less capable BT device is better than a more capable but non-functional one. Go figure! For more information on what’s up, you can check out this Bluetooth declaration at the Bluetooth Launch Studio. It shows that on April 10, 2018, MS got no less than 11 different Windows 10 products certified for BT. 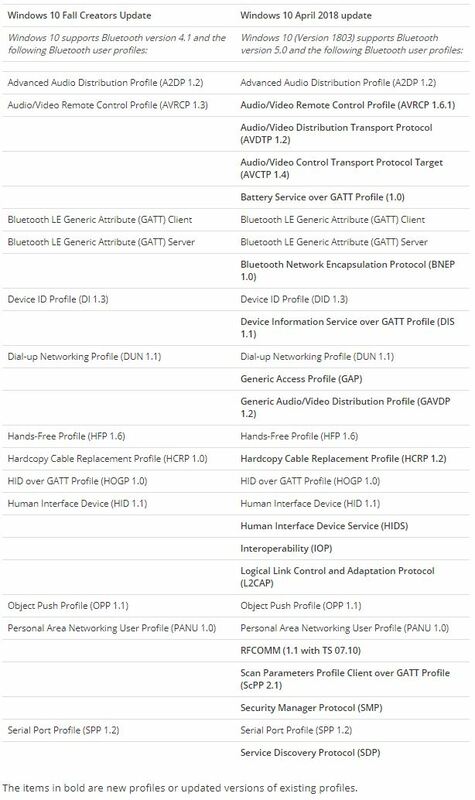 You might also find this MS list of Supported Bluetooth profiles interesting as well. My special thanks to MSPowerUser Surur, who did all the hard work of comparing the 1709 and 1803 versions of this list and who put together the table included in this blog post, too. It also shows that when Win10 1803 gets new Bluetooth version, results do not necessarily benefit all users.